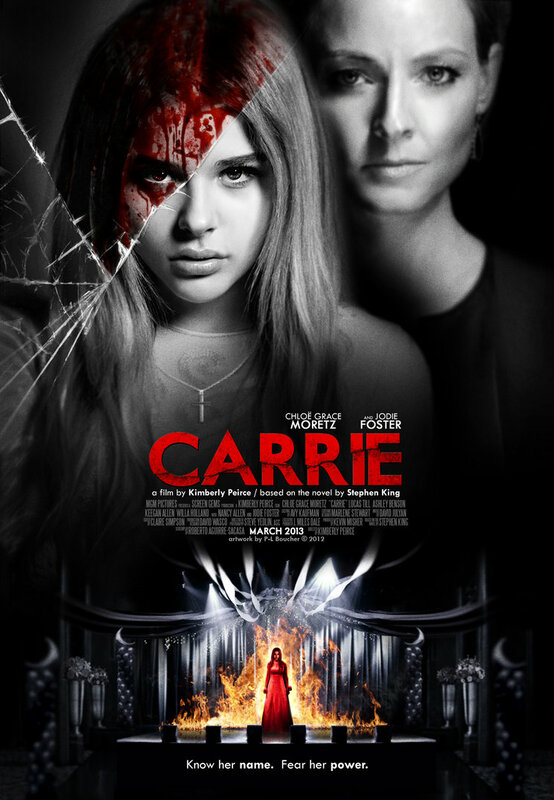 The new Carrie by Kimberly Peirce is one of the newest and most anticipated horror films of this season. Does it live up to the hype? With the start of another Halloween season, we find ourselves with a new slew of horror films to entertain ourselves with. More often than not, we must wade through the schlock in order to find the real gems. Based on Stephen King’s memorable novel, Carrie was released October 18th. A remake of Brian DePalma’s classic, it was done by director Kimberly Peirce (who also worked on Boy’s Don’t Cry and Stop-Loss). Usually, horror movie remakes aren’t much to freak out about, but Carrie was one many people were looking forward to, what with all the room for improvement on what the 1976 original didn’t have. The goal to give Carrie a fresh new look was openly obvious. But did Peirce succeed? While the new remake isn’t insanely awful, it really pales in comparison to DePalma’s classic. Both versions have their negatives and positives, but there are a few things in particular that I just couldn’t let go whilst watching. Peirce’s fails to bring about the true power of Carrie White’s abilities. In DePalma’s, she doesn’t have true control of her telekinetic powers. Chloe Grace Moretz does a notable job with the role she’s given, but Peirce has taken the raw, uncontrollable power and turned it down a notch. Actually, a lot of notches. To the point where we see Carrie controlling her telekinesis after doing a little research. In Sissy Spacek’s performance, we see an teenage girl plagued by otherworldly power, emotionally pushed to the brink. We just don’t see the same extremes in Peirce’s rendition. Both are a shout-out to the bullied and emotionally-tormented, which I can respect and understand, but while DePalma’s classic walked the line between a gory revenge-filled fantasy, and the social controversy, Peirce’s doesn’t quite make it that far. The audience doesn’t feel as conflicted, since Peirce makes Carrie out to be more of a victim. There’s not as much glorification of her revenge, playing it out as quick and superfluous. This may be because Peirce is taking the film and rehashing it from a female perspective. Not to say this is bad, as a female myself, but throughout the film it brings out a sense of modesty that the 1976 original doesn’t have. (i.e. the shower scene, where it seems like the camera is repelled by any immodest part of Moretz’s body. Instead of a naked, pleading Spacek, Moretz isn’t so distraught that she forgets to cover up first — nicely done Chloe) If the film were to let this go, and just ‘let everything hang out’ it probably would have gone better, and be a better experience for the audience. I mean — in the classic — some of those scenes were just downright uncomfortable. Another thing (and this may be just from my bloodthirsty teenage mind) but in the area of special effects and cinematics, it didn’t really meet expectations! Well, compared to DePalma’s, it was obviously technically superior, but that’s just because of the time period. We have the technology to make some pretty awesome effects, and a lot of them. One of the most important and iconic scenes in the book and film was the Prom Night Massacre. It was big, brutal, gory, and more than anything: supposed to show Carrie’s true power, and the true torment she was under and how she could do the same for others. Yeah, it just didn’t happen. At least not how I thought it would. It just did not live up to what could have been. Like I said, the glorification of her revenge that the prom night carnage was supposed to do was quick and superfluous. They could have done so much more with what was available to them! More blood! More destruction! More gore! At the very least, make the girls who tormented her pay more dearly then just being set on fire or trampled! In the book, the carnage was supposed to pump out 400 deaths, and at least half of the senior class. The only death that was really satsifying was that of the antagonist: Chris Hargensen. Since the goal was to provide a fresh new look to a classic horror film, my opinion is go big or go home. Other than that, the performances of leading ladies Chloe Grace Moretz and Julianne Moore were what really made the film. The mother-daughter relationship they portrayed was done extremely well, mainly because of how different it was from Spacek and Piper Laurie’s. Moore’s portrayal of Margaret White as the obsessive and practically religiously-insane mother was the only scary thing in the majority of the film. The two of them and their performances outside and in their realtionship are one of the only things I really liked about the film. On it’s own, the new Carrie is not a bad film. But in comparison to Brian DePalma’s classic, it just wasn’t that great. Either way, it was a good try, Kimberly. This entry was tagged Boys Don't Cry (film), Brian DePalma, Carrie, Carrie 2013, Chloë Grace Moretz, Halloween, horror, Julianne Moore, Kimberly Peirce, Margaret White, Peirce, Sissy Spacek, Stephen King. Bookmark the permalink.